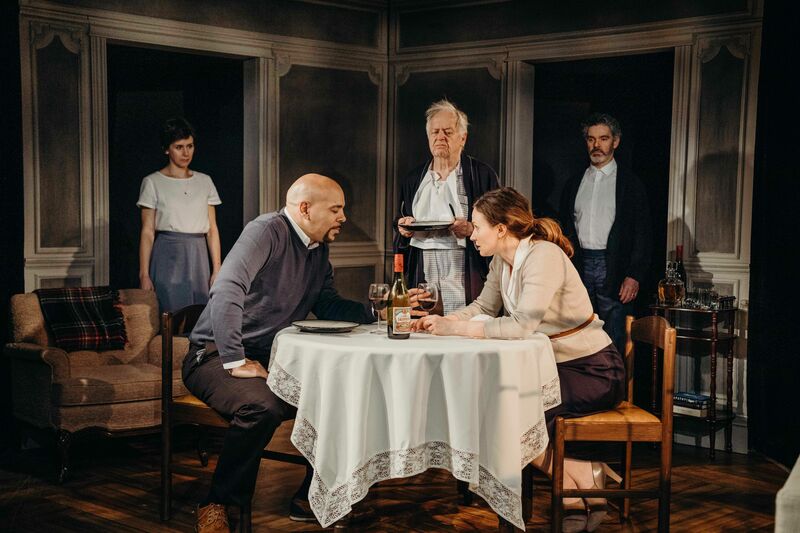 French dramatist Florian Zeller sharpens perceived reality in The Father with director Ted Dykstra chipping away at textual tone for a theatre event that will leave you uncontrollably verklempt when venue goes dark. The heartrending drama plays Coal Mine Theatre until March 3, 2019. The thing about paternal figures is that they’re rarely on the same page as the rest of us. Needs and priorities are frustratingly just never in sync. Which begs the questions: Is there even such a thing as a perfect dad? Maybe not. You wouldn’t know this, however, after experiencing Coal Mine Theatre’s profoundly touching presentation of The Father where a spry and indelible Eric Peterson in the role of Andre may hands down be the best role he’s ever played on stage, a role that seems like it was written for him personally. He triggers subtle laughter when he wants to and relentless sorrow when he has to. In short, this is the work of a master in full command of his art. All of which shadows the supreme contributions of a stellar ensemble that makes you feel as if you’re a fly on the wall throughout all the moving pieces of the production. Witnessing an elderly man in his crankier moments following a misplaced watch and caregiver replacement process has its humor and tender moments. The mesmerizing Andre is equal parts charming, punctual, set in his ways and eccentric in recollection of the past and present. It’s only when his increasing discombobulation persists does your heart skip a beat for this lost soul succumbing to dementia. “All of this nonsense is driving me crazy,’ rebukes the uneasy senior when the facts fail to fit into place at a level of comfort to which he’s accustomed. The clever construct of features re-appearing actors in varied roles clearly demonstrating to the audience the terror of confusion that awaits us all when we inch forward to our final stage of life. Its alarming reaction to a mind spinning out of control is palpable. Deteriorating mental capacity is a scary concept despite the life long memories under lock and key of the beholder. The visceral elements of love, patience and compassion personified by Patricia Fagan’s Anne to her fading father proves humanity is the single most important life preserver we can extend to others.